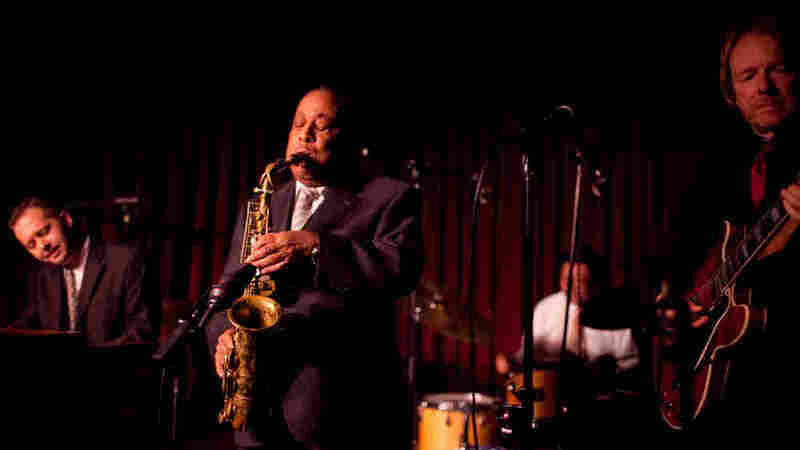 By the time he started his latest weeklong run at the Village Vanguard, alto saxophonist Lou Donaldson was 84. He’d been based in New York for 60-odd years, during which time he became a jazz legend — the kind who made albums that are still remembered today, who recorded lines memorable enough to be sampled years later, who toured the country’s back rooms back when a jazz musician could post up for two weeks at a time in, say, Dayton, Ohio. It bred in him a style that was solid, soulful and swinging, with a charismatically salty wit to match. It hasn’t broke, and he hasn’t felt the need to fix it. When “Sweet Poppa Lou” descended into the basement and ascended to the stage, there were the japes, the blues singing, the exemplary straight-ahead jazz he’s pursued for decades. (“No fusion, no con-fusion,” he said — twice.) WBGO and NPR Music will be there to broadcast and webcast the first Nov. 3 set live; it will also be recorded and archived online on this page. Since recording with organist Jimmy Smith in the late 1950s, Donaldson has often worked with a rhythm section of Hammond B-3 organ, guitar and drums. That instrumentation allows him to dish on funky, danceable grooves; not coincidentally, it was responsible for some of his most famous appearances on record. He reprised some of those greatest hits — “Blues Walk,” “Alligator Bogaloo” — and called some favorites from the bebop and hard bop eras. He even sang some blues: his trademark “Whiskey Drinkin’ Woman,” with many embellishments by way of prologue. With him at the Vanguard was his current working band: Pat Bianchi on organ, Randy Johnston on guitar and Fukushi Tainaka on drums. Donaldson grew up in North Carolina. While playing in military and dance bands, he became enamored of Charlie Parker, then the modern trend in jazz. When he moved to New York to make it as a musician, he found his way into the community and, after a few years, was invited to record for Blue Note Records. He made some of his most celebrated albums for the label, and also recorded there as a sideman with Milt Jackson, Art Blakey and Jimmy Smith. Though not as often as when he booked his own tours on the 1960s chitlin circuit, Donaldson still occasionally travels the world for gigs. He’s also still based in New York City, which makes it convenient for him to play weeklong runs at the Village Vanguard. Of late, he’s done so about twice a year.